This Hubble photo of 30 Doradus was taken Oct. 20-27, 2009. The blue color is light from the hottest, most massive stars; the green from the glow of oxygen; and the red from fluorescing hydrogen. The Hubble Space Telescope has captured a festive view ofthe cosmos in time for the holiday season, with some saying the picture of astar nursery looks like a wreath, maybe a Christmas tree, or even Santa. 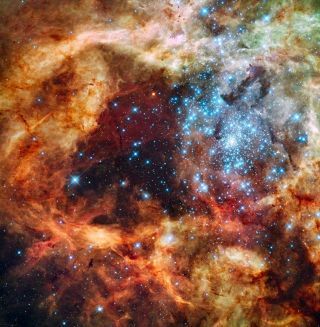 The spacecraftobserved a group of young stars called R136, which is only a few millionyears old and inhabits the 30 Doradus Nebula, part of a relatively nearby satellitegalaxy of our Milky Way called the Large Magellanic Cloud. In the photograph, hundreds of brilliant blue stars aresurrounded by a ring of warm, glowing orange clouds of dust. The colorfulportrait evokes a giant wreath of pine boughs studded with glowing jewels ?sort of. And in the hollow center, the dark shadow has the distinct silhouetteof a Christmas tree. Really! Finally, if flipped 90 degrees clockwise, the image evenresembles the face and beard of Santa Claus himself. Somewhat. Well, whether or not this heavenly view actually hasanything to do with the season on Earth, it does teach scientists about what'shappening up above. The image was taken in ultraviolet, visible, and red lightby Hubble's Wide Field Camera 3, and spans about 100 light-years across. Alight-year is the distance light will travel in a year, or about 6 trillionmiles (10 trillion km). Many of the young, hot stars in the picture are extremelylarge, with a few over 100 times more massive than our sun. The powerful starsare pouring out torrents of ultraviolet light and streams of charged particlescalled stellar winds, which are carving out deep cavities in the enveloping hydrogengas cloud. And a cycleof birth, death and rebirth is occurring. When the winds hit dense walls ofgas, they create shocks, which in turn help to trigger a new wave of starbirth. Meanwhile the large progenitor stars live out their lives relatively quickly,eventually exploding in supernovas like a string of firecrackers.